There has been a cathedral, dedicated to St. Paul, on this, the highest point in the city, for over 1400 years. This is the fourth building to occupy the site. The first buildings were constructed in 604 AD and were constructed of wood. These buildings were constantly damaged by fire, or, attacked by Vikings. In 1087 a new cathedral building was begun, which, when completed in 1148, would remain the home for the Roman Catholic Church, in England, until 1559. This building was taller, longer and wider than the current cathedral. Following the damage to the fabric of the building, during the Reformation, things began to look more bleak as a lightning strike, on the spire, set fire to the steeple and roofs. The heat also exacerbated the damage already done to the stonework. In 1633 the architect, Indigo Jones, was tasked with restoring the cathedral, but his work was halted by the outbreak of the English Civil War. Parliamentary forces took control of the building, using it as a barracks where, at one point, 800 horses were stabled. With the restoration of King Charles II, in 1660, repairing of the cathedral was soon back on the cards. Sir Christopher Wren, who had studied Italian architecture, suggested that the new building should have a dome. This was agreed upon in August 1666. With scaffolding in place everything looked good, until just one week later, when a fire broke out on Pudding Lane. Two days later the inferno reached the cathedral and with the aid of the wooden scaffolding, and the hundreds of books that were stored in the crypt, all but razed the building to the ground. 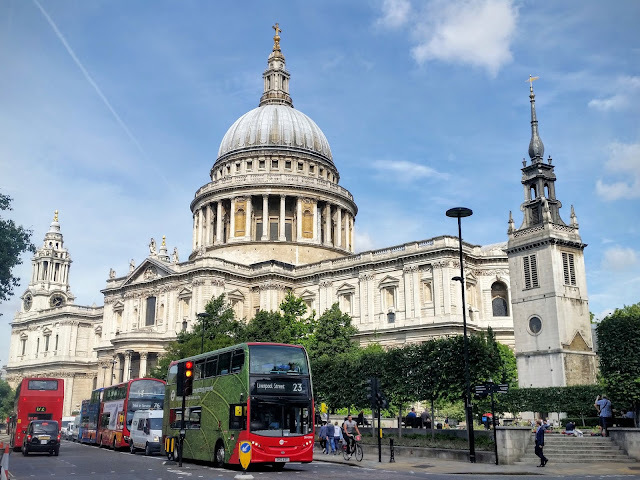 Beginning in 1675, Sir Christopher Wren's masterpiece took shape over the next 33 years, with the last stone being laid on October 26, 1708, although the first service had been held back in 1697. Unfortunately, the building was not as well received by the royal family as had been hoped and, following a visit from King George I in 1715, no monarch would visit again until King George III attended a special Thanksgiving service in 1789. Two state funerals were held at St. Paul's Cathedral in 1806 and 1852. The former for Admiral Horatio Nelson, the latter for Arthur Wellesley Duke of Wellington. There was also a special Diamond Jubilee Thanksgiving Service, for Queen Victoria, held in 1897, which proved a massive success. Between 1925-1930 the cathedral was closed as structural repairs were carried out, to sure up the structure; Cracks had appeared below the dome as well as in other areas. These repairs turned out to be well-timed as, during World War II, the cathedral suffered two direct hits from German bombs.